Consider: We have witnessed unprecedented Democrat obstruction and violence since President Trump was first elected. Meanwhile, hoaxes carried out by leftists and Muslims, whether painting swastikas on college campuses, reporting “Islamophobic” threats, or even burning black churches, have become ubiquitous. They would probably stop of the media would report them more faithfully. People have become so used to Democrat antics they are numb, while Democrats from Hillary on down blame President Trump for the “atmosphere of incivility.” But then we had the Kavanaugh hearings. The outrageous behavior was so over-the-top and obviously engineered by Democratic senators that it energized what had been an exhausted and somewhat dispirited GOP base. So that backfired on them — big time. Then we got the Central American Caravan, an obviously-staged mass migration instigated by the Honduran Left, and enabled by Soros-funded open borders organizations. This was meant, and still is meant, to be a direct challenge to Trump’s authority. The media is pouring barrels of ink on establishing that this was a spontaneous development by “families with children,” escaping intolerable situations. But we know that this is not so. Most are young men of military age, just as has been with the invasion of Europe from the Middle East and Africa by waves of military-aged males. The media then finds “man on the street” spokesmen who admit they seek to reach America for jobs — all of whom just coincidentally speak fluent English. But even this is a misdirection. As President Trump has said and law enforcement agrees, there are MS-13 gang members as well as Middle Eastern terrorists likely seeded with them. Honduras arrested close to 100 ISIS-connected terrorists. They were arrested and deported before the caravan began, but does that mean they did not intend to join the caravan? Were all of them caught? To assume so would be the height of irresponsibility. Especially when we know that ISIS has warned it would penetrate the U.S. through refugee resettlement did so in Europe — two of the Paris attackers came in with the refugee flow — and there has been a large, active Hezbollah presence in South America for years. The media has also underplayed the size of the caravan, claiming it to be about 7,000 strong. But if you consider that it is one, two or even three miles long, it could be three times that much or more. In any event, this was clearly an effort to create a major issue for the GOP in the lead up to the election, and take attention away from the Kavanaugh issue. Well, it certainly did, but it backfired. We Americans are infuriated by this arrogant, outrageous challenge to our national sovereignty. Who’s to blame? The Democrats of course. So now they’ve invented an even more outrageous meme: that some angry “conservative” has targeted prominent Democrats and their media allies with bombs. This has had the salutary effect of taking all eyes off the caravan, the Democrat MOB and everything else while pointing the finger again at those mean old conservatives. But as Maxine Waters demonstrates, it is the Democratic Left that uses violence to express their opinions, not Republicans or conservatives. 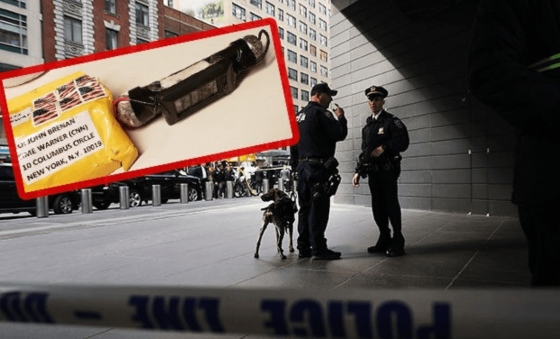 News reports are now focused on these “suspicious” packages and the motive of the sender(s). They are indeed suspicious, but maybe not the way people think. Following are photos of the bomb sent to CNN. First, none of these bombs went off. It has now been reported that the device sent to CNN was inert, and law enforcement believes all devices were sent by one individual or group. All of the bombs featured this kind of labeling and packaging. Likely we will learn they all were inert. Second, note all the blatant misspellings. Brennan is spelled with one n. Florida is spelled Florids. Brennan does not work for CNN but for MSNBC. Also, it does not appear that this package was postmarked, implying that it was not delivered by mail. Did someone carry it in? A CNN employee perhaps? Finally, it would be obvious to all but the most uninformed (who would likely not have the intellect to build a bomb), that suspicious packages sent to these people would be intercepted well before reaching the intended party. I put nothing past these sick people. One final bit of evidence. The CNN package apparently had a small ISIS flag parody with Larry the Cable Guy’s slogan, “Get ‘Er Done.” This parody was created by the conservative satire site, World News Bureau. I’m sure that’s where it came from. If investigators discover the source was a leftist, the story will die a sudden death in the media, just as the Las Vegas attack did. If they do manage to pin this latest on some stupid lunatic who happens to have a GOP registration, he will have been a patsy specifically lured into pulling off this stunt. One last possibility is, in fact, the Russians. They did not influence the 2016 election for Trump, but they are always trying to provoke division and chaos. And if forced to choose, Russians would always choose Democrats, their unspoken American allies for decades. I refuse to believe there is any conservative of sane mind that would do this. Democrats have shown by their repeated actions that sanity is not a strong suit for any of them. And ethics is a word they have never heard of.